File type & creator changer. Is there a better alternative to Quick Change? Is Quick Change really the best app in File Management category? Will Quick Change work good on macOS 10.13.4? Those of us who want a fast easy way to change and view file associations it doesn't get much easier than Quick Change. Quick Change offers a customizable list of user-defined types & creators and file extensions which allow for quick file association on Mac OS X. 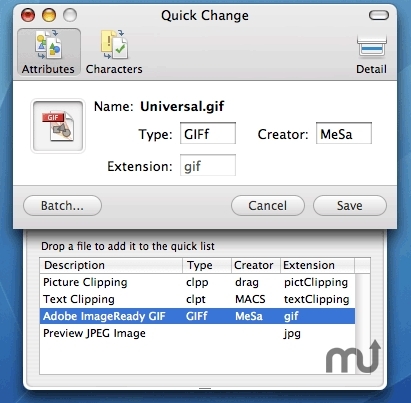 Quick Change also allows users to replace file name characters which are illegal on other platforms automatically making copying files quick and easy. Added automatic illegal character replacement in file names for copying them to other platforms. Now Universal binary for native Intel support. Requires 10.3.9 or higher. Can now batch change file extensions. When saving type/creator it now updates the file modification date. When dropping a file on the Quick list it now automatically fills the file description with the kind information. Tooltip for the selected file now shows the application to open the file and the file kind. Fixed a bug in which you couldn't modify quick list descriptions after being saved in Mac OS 10.4. Other minor improvements and changes.